July 2016 Update - FedUp! On July 13, the Senate passed the Comprehensive Addiction and Recovery Act legislation. The CARA legislation is the only bill to make it out of congressional committees and make it to the floor of the House and Senate – it is likely the only attempt to get something done in the 114th congress. But even if the measure is signed into law, much more needs to be done. The measure expands federal efforts to prevent addiction, increases access to life-saving naloxone, attempts to encourage alternatives to incarceration for drug offenses, expands access to buprenorphine and establishes (but does not fully fund) new grant programs for recovery and treatment among other provisions. Attempts to fund the opioid bills (House bills combined with the Senate version of CARA) with emergency funding were rebuffed. Further opposition to the President’s budget request for $1.1B which included $920M directed to expand treatment access will now require congressional appropriators to fund the bill during the upcoming budget resolution process. Current levels of funding now being discussed are less than a third of that requested by the President. While we fight to get every dollar possible to provide much needed treatment funding, the bill includes a Medicaid rebate to pharmaceutical companies for Abuse Deterrent Formulations (ADFs) of opioids. ADFs are just as highly addictive as regular formulations and Pharma does not need additional financial incentives from the federal government. The bill also includes, yet again, another task force to examine pain management issues with representatives from pain organizations funded by Pharma. This appears to be a backdoor process to undermine the CDC opioid prescribing guidelines issued this spring. 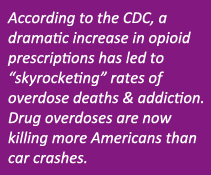 The prescribing guidelines will save lives. CARA also fails to ensure interstate operability and mandatory use of PDMPs which have both been shown to be effective in reducing the overprescribing of opioids. While advocates across the country may applaud Congress’ first attempt to address the opioid addiction epidemic striking the nation, please keep in mind that much more will need to be done to address additional policy and legislative changes and certainly to provide funding for greater access to treatment. Please keep pressing your federal representatives to address deficiencies in the CARA legislation and to demand full funding for treatment. Attend the FED UP! Rally on September 18th and make your voices heard! This entry was posted in Advocacy Updates on July 1, 2016 by FedUp Rally.